I was approached by Asana Rebel to create a 10 minute Instagram TV video for those who like to cycle or spin. I love Asana Rebel’s approach to fitness, as yoga means different things to different people and they cater for all. Check out the IGTV video on their Instagram HERE. The LDN Brunch Club are a London based running club, providing support, training and events for keen runners. In January LDN Brunch Club had a focus on rest and recovery. On a Friday evening after a 5K run I led the runners through a recovery yoga session, focusing on the hips, hamstrings and spine. The sessions are sponsored by Under Armour UK and I have led 2 so far in 2019. You can check out the LDN Brunch Club HERE. This yoga for Irish dancers course consisted of 3 stages which was tailored to suit the needs of Irish dancing. There was a strong focus on core strength and flexibility in this course. The course included 15 x 10-15min videos with an accompanying PDF guide to break down poses and practises in further detail. You can check out the course for Reaching New Heights HERE. I explain how different types of verbs help me instruct a yoga class and the importance of language to create a positive experience for the yogis. 3 images were posted on my Instagram, over 3 weeks with the specified hashtags and tags requested by the brand. You can see the full collection of images on my Instagram HERE. This consists of 7 x 15-20 min yoga videos created in partnership with eco-friendly and sustainable brand Asquith. Each yoga video has a new focus everyday and features the Asquith logo in each video as well as different outfits throughout the week. This yoga series was hosted on my YouTube channel and Asquith will be using the content across their social platforms and mail outs. Check out the 7 day yoga series HERE. This is a 4 part series of 30min Facebook Live videos for MyVoucherCodes, giving people a chance to get fit, for less. Filmed from my home studio and kept simple, so easy to follow along at home. MyVoucherCodes main demographic is, women between the ages of 35-55, I tailored my yoga flows to suit. Watch the Facebook live videos back HERE. London lingerie and swimwear brand Beija, asked me to feature on their blog, where they showcase women at work, wearing their gorgeous sets. This blog post is set at my home and studio, You Are Here Studio and I answer Beija's questions based around my day-to-day life as a yoga teacher and East London resident. Creating video and still images to be used on the brands Instagram main grid and stories, as well as blog posts. This is a set of 6 yoga moves which can be done at your desk at lunchtime, to take 5 minutes for yourself and reclaim some of your lunch break. The video and images were created to showcase this workout set from Every Second Counts, AW17 collection. The Boxx Method is an online workout platform specialising in boxing, HIIT, strength and stretch workouts. I plan and film all the yoga sequences , which vary from fast, power yoga flows, to post workout deep stretch practises. Try a 10 day FREE trial and enter HELEN10 at the check out to receive 10% off subscriptions and plans HERE. Also look out for their FREE Instagram and Facebook Live classes. 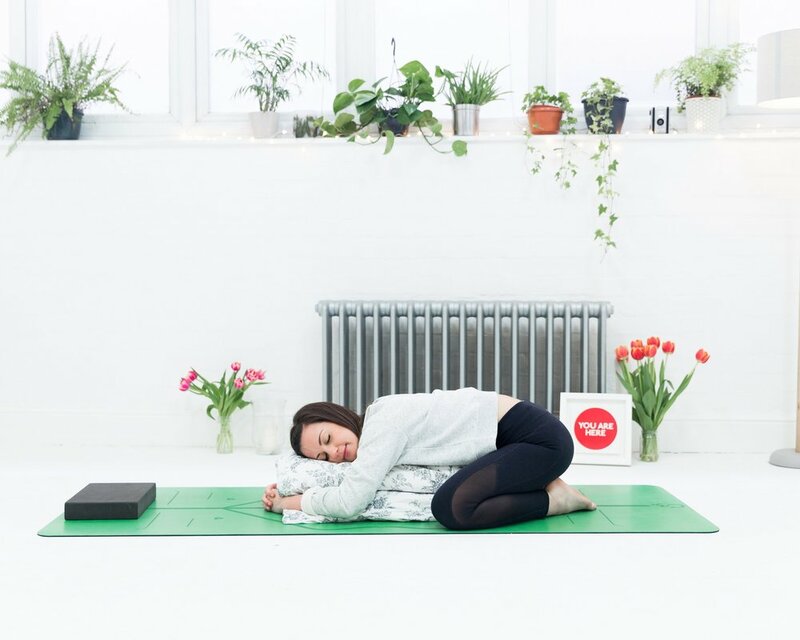 A gentle restorative yoga sequence using pillows from the bed or sofa, to help relieve period pains, such as stomach cramps, lower back ache and nausea. I shared an Instagram story which consisted of 5 simple yoga exercises and stretches you can do at your desk to relieve tension from the hands, neck, shoulders, lower back and hips. These yoga moves are ideal to do during the day, when you may have been sitting for an extended period of time. These gentle yoga stretches were picked up by LOOK Magazine and shared on their fitness page. A day of Yoga, HIIT and Tension Release sessions held at You Are Here Studio, with stalls from Hackney based fitness brand Harvey & Mills, vegan beauty brand Manas Organics, prints from Stephanie Breeze, oils and skincare from Fisical Oils, men's leggings from Stitch Leggings and many more. With over 250 people passing through our doors and some incredible vegan brands contributing to the goodie bags, it was an amazing day of health and wellness and all that good stuff. Check out the video of the day HERE. A chat with the Style PB founder Natalie Dale on becoming a yoga teacher, studio owner and StylePB woman.